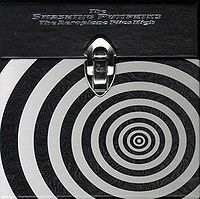 The Aeroplane Flies High is a five-disc box set released by The Smashing Pumpkins in 1996. It contains expanded versions of the five singles from their album Mellon Collie and the Infinite Sadness and also included a 44-page booklet with pictures and writings by the band's lead singer Billy Corgan, as well as lyrics. A limited edition release, the box reached #42 on the Billboard charts, and sold 300,000 units (1.5 million discs in all), generating a platinum disc for the band. Originally intended to be limited to 200,000 copies, Virgin Records produced more after the original run sold out due to overwhelming and unexpected demand.